Length: Up to 120 cm. The animals usually only reach a length of 80 to 90 cm. Distribution area: Up until now the Oreophis porphyraceus porphyraceus has been found in Thailand at Doi Suthep in Chiang Mai and at Doi Ang-Kang in Mae Hong Son. The occurrence of the Oreophis porphyraceus coxi is limited to the provinces Loei and Phetchabun. Due to their secretive lifestyle, it is expected that they do exist in a wider area. Behaviour/habitat: The top side is red to yellowy brown. On the body, there are 17 to 18 red-brown, black and white horizontal stripes. Bot the Oreophis porphyraceus porphyraceus and the sub-species Oreophis porphyraceus coxi exist in Thailand. 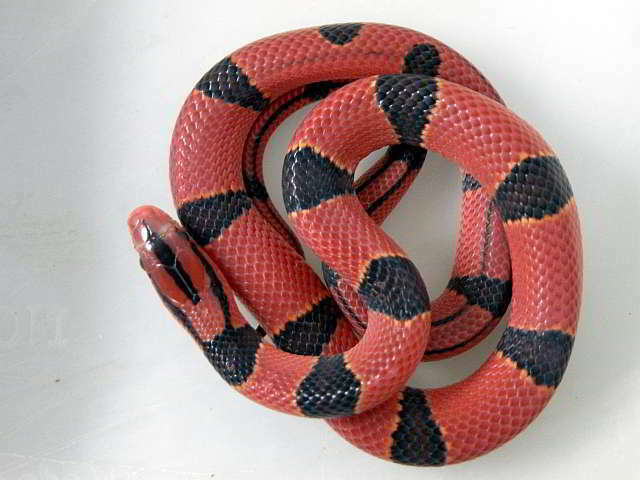 This species has orange-red as the main colour with 2 long black stripes on the top side of the body. These snakes live at the edges of wooded areas where they feed themselves on rodents, lizards and frogs. The snake is extremely rare, does not live around human settlements and is strictly protected in Thailand. Habitat/behaviour: Since Oreophis porphyraceus coxi was described in 1998 by the German amateur herpetologist Klaus Schulz, very little more about its behaviour in its own environment is known. The information contained here refers only to observations of captive snakes in a terrarium. Oreophis porphyraceus coxi is found exclusively in cooler mountain regions. In the coldest months of December and January, the snakes hibernate. They are active primarily in the early morning hours and at dawn. Their diet consists of rodents, lizards, and small birds. The females lay between 2 and 7 eggs several times in the year, out of which the young are hatched after approximately 48 - 55 days. Contrary to the adult snakes, the young have one to three black transverse marks behind the head. These transverse markings fade over time and are no longer visible by the time the snakes are two years old. These types of snakes exist in Thailand under strict protection. In the terrariums of Europe and America, however, they are easily to breed and it is therefore assumed that, due to their relatively simple reproductive success, there are more snakes and offspring living in terrariums than in are living in the wild in Thailand. Distribution area: Kanchanaburi, mountainous regions along the Malaysian border. The exact occurrence of Oreophis porphyraceus laticinctus in Thailand is still unclear. In addition to the fact that an animal that was found in the northwest of Thailand, according to reliable sources a second animal has been found in the border region with Malaysia. 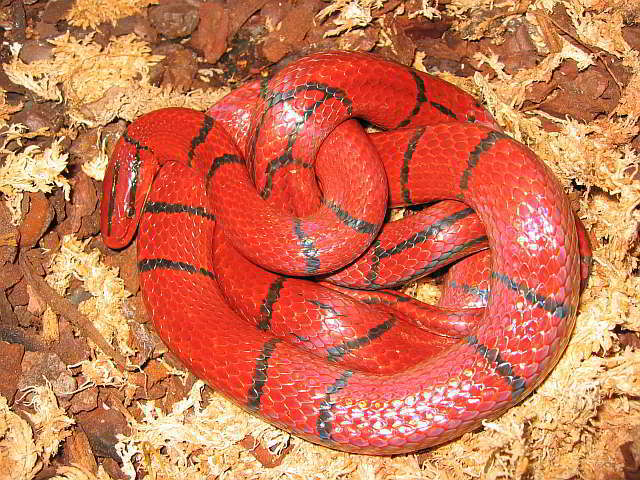 Habitat/behaviour: When discussing the Broad Banded Red Bamboo Rat snake it should be mentioned that this was only recently declared to be found in Thailand. In the literature, the habitat of oreophis porphyraceus laticinctus is Malaysia (Cameron Highlands, Pahang, West Malaysia), North Sumatra (Brastagi) and Indonesia. The snakes inhabit the very humid, cool mountain rain forests. Here they seem to prefer the light filled areas of undergrowth. However they can also be found in tea plantations and vegetable fields. The snakes are active at dusk and at night. With regard to their eating habits in the wild, there is only one report at present. A sort-tailed mole was found in the stomach of animal that had been run over. In captivity the Oreophis porphyraceus laticinctus will also eat small mice. During the cold season, the animals hibernate. Several times in the year females lay between 4 and 8 eggs. 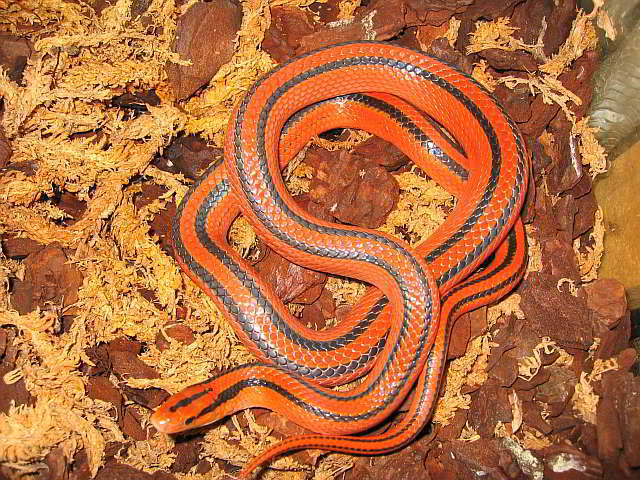 Unlike the adults, the young animals exhibit a red-yellow diagonal band, which is surrounded by narrow black bands.